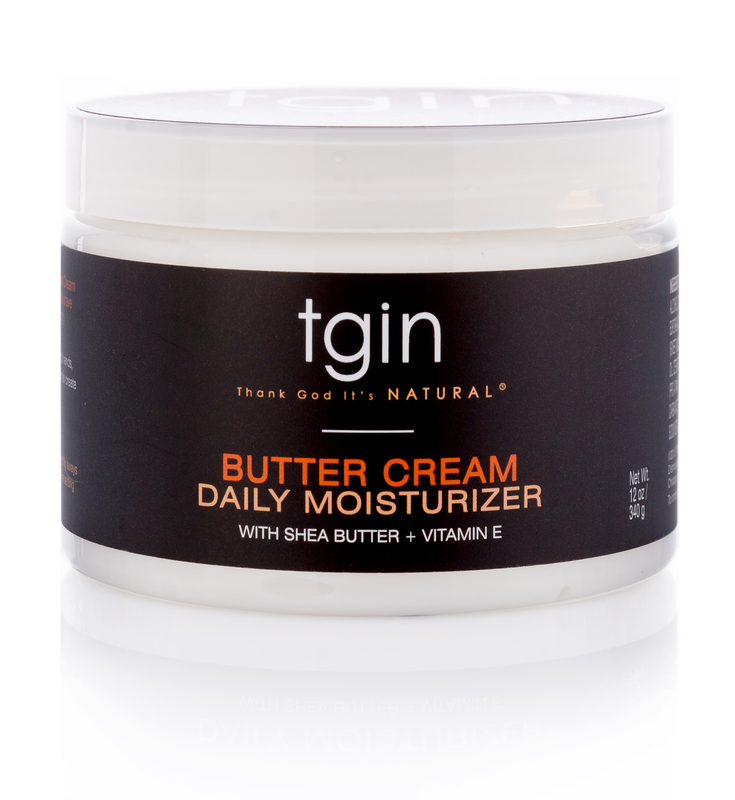 Make tgin Butter Cream Daily Moisturizer a part of your routine! The #1 complaint of most naturalistas is "dryness." 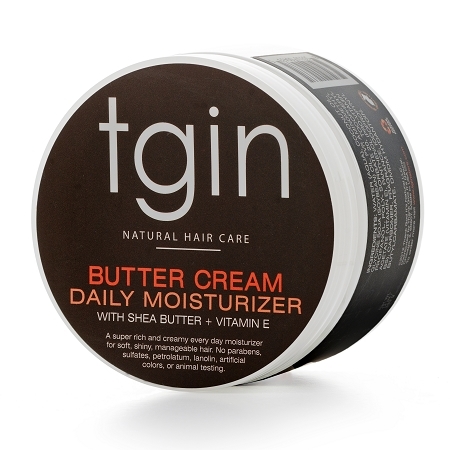 In response to this we have formulated our tgin Butter Cream Daily Moisturizer for natural hair. Now you will never have to worry about frizz or dryness again. We intentionally use ingredients like Shea butter, Cocoa butter, and Vitamin E oil both to target dryness at its source by moisturizing from the roots to the tips and to prevent dryness. This everyday moisturizer aims to give you consistently soft, shiny, manageable curls while nourishing your scalp. Our products have been featured in several publications such as Essence, Ebony, Marie Claire, Black Enterprise, USA Today, Heart and Soul, and Sophisticate's Black Hair. This product does not contain any parabens, sulfates, petrolatum, lanolin, or artificial colors, and no animal were used during testing. Ingredients:WATER (AQUA), GLYCERIN, BUTYROSPERMUM PARKII (SHEA BUTTER), CETEARYL ALCOHOL, COCONUT OIL, AMODIMETHICONE, BRASSICAMIDOPROPYL DIMETHYLAMINE, OLEA EUROPAEA (OLIVE) FRUIT OIL, THEOBROMA CAOCAO (COCOA) SEED BUTTER, PRUNUS AMYGDALYS DULCIS (SWEET ALMOND) OIL, TRITICUM VULGARE (WHEAT) GERM OIL, PEG 4 HYDROGENTATED CASTOR OIL, CETEARETH-20, ALOE BARBADENSIS LEAF JUICE, HYDROLYZED SOY PROTEIN, PANTHENOL (PRO-VITAMIN B5), ASPATRIC ACID, FRAGRANCE, CYCLOPENTASILOZANE, IODOPROPYNYL BUTYLCARBAMATE, DMDM HYDANTOIN, BENZOPHENONE-3, TOCOPHERYL ACETATE (VITAMIN E), TETRA-SODIUM EDTA, SIMETHICONE, BHT. I have been using Cantu's leave in conditioner for many years and considered it to be the holy grail of moisturizers. 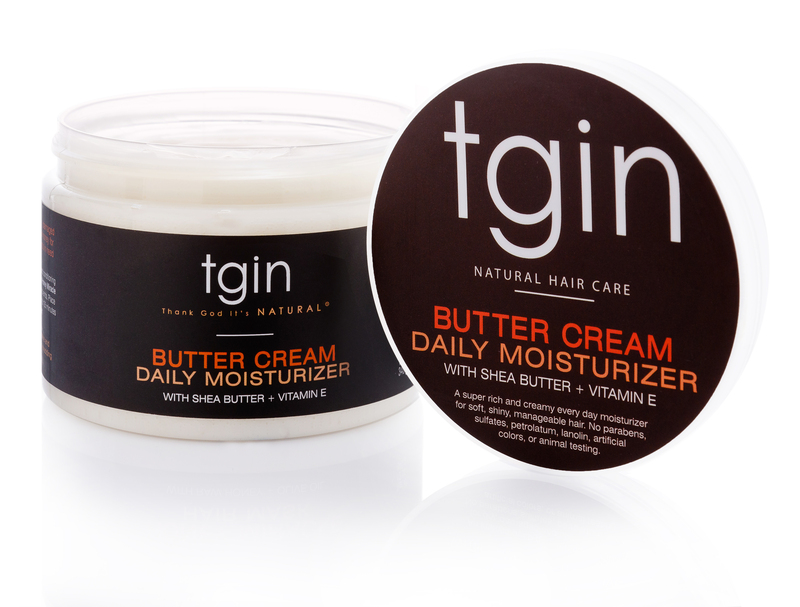 My hair has been VERY dry and I decided to try TGIN's butter cream moisturizer. I saw great results from the very first use. I immediately trashed my cantu and will never look back! The butter cream instantly moisturized my hair. It literally still feels very creamy after wearing my hair out all day. Not to mention that using a small amount of the butter cream goes a really long way. I am so thankful to find this product and am ordering more of their products today. You HAVE to try this!!!! I am normally not for curl definition. I LOVE MY FRO BIG!! HOWEVER, this product literally grabs a hold of my tresses and gives the most perfectly defined curls. My hair is so soft and it feels like a seal is wrapped around each strand from root to tip. I was on the fence for trying this line due to the price but SERIOUSLY it's worth every penny. ps..my mother asked me "whats going on with your hair its so picture perfect?" My answer was Thank God its NATURAL. I was introduced to this product by my stylist. She seeks out quality products that are well made and she tests them on here clients to see what works best for the individual. I love her prices. It truly helps eliminate having to waste $. She also gives samples. Ok, now I've tried many butters and creams with moisturizerizing promises, but this is the ONLY one that have lived up to what was promised. Not only is it a GREAT moisturizer, the moisture remains locked in. Best of all, you literally...I mean literally only have to use a small amount. This is my go to. I will say that's it's not for every hair type, but I encourage you to start with the sample and go from there. The entire line (shampoo, conditioner, mask) is really high quality and effective. My favorite part about this product is that it can actually be used as a daily moisturizer without causing build up or making my style revert. 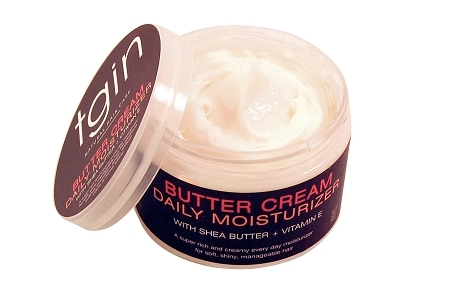 Typically after applying TGIN Leave-In and sealing in the moisture with an oil, my hair stays moisturized for about 3 days before I find myself needing to use the Daily Buttercream Moisturizer. I only need to use a small amount per section, especially when my hair is wet. It keeps my hair moisturized for daysss and gives hair a slight hold to make styles last longer. If I use this product to retwist, my hair will be hydrated and styled all over again as if I had had another wash day. Also, it smells AMAZING!